My dear friend informed me that one of the local nurseries was having a 70% off sale on all plants. I restated, “All plants…including trees and shrubs?” She confirmed. Forget the fact is was 98 degrees, we were going shopping. I love a bargain, especially on plants. The west side of our house does not have a single plant. 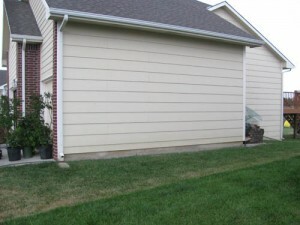 For years, I have wanted to hide the foundation with an assortment of shrubs. Now was my opportunity to put in a new bed at 70% the cost. With kids in tow, we wondered up and down the aisles of the nursery. I had a good idea what I wanted to plant, but I wanted to see what other plants were available. The longer I shopped the crankier everyone became. It was hot and the girls were thirsty. I pulled my wagon full of shrubs into the store, made my purchase and crammed my bargains into the van (I am still dreaming about owning a pick-up truck). It’s good to find a bargain, but you have to be cautious with plants. Sometimes, the plants may have been neglected and left unwatered. You are setting yourself up for failure. Before I made my purchase, I asked if there was a warranty. Many times nurseries will not offer warranty on sale items. 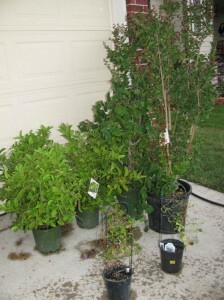 It’s especially important to have a warranty when you are buying trees and shrubs in the middle of summer. Midsummer is NOT the ideal time to be planting. Summer time heat is stressful to a newly planted tree or shrub. You have to work harder to keep that plant alive. Now that I have made my purchase, it’s time to prepare the soil for planting. Currently, there is beautiful grass right where I want to landscape. My husband, Dave, works very hard keeping our grass green and beautiful. I will smile, bat my eyes and sweet talk him in to breaking up the sod and tilling the soil. We will also get a load of compost to amend our clay soil. It’s very tempting to just dig a hole and drop in the shrub. But I know from experience that the shrub will struggle because clay soil has very poor drainage and little organic matter. For my landscape to grow and thrive I must take the time and resources to amend the soil with compost. Adding compost will help aerate the soil, which helps with drainage. The compost will also provide the plants with the macronutrients: nitrogen, phosphorus and potassium, the plants needs to grow. For information on planting a shrub, check out my video. So until my dear husband revs up the tiller, my bargain plants sit in the shade waiting for their new home. Got Soil? Where’s Your Spoon? A few months ago, I nocteid something very, very strange going on with my houseplants. I’ve always had a touch with them, and I’ve had many of the same houseplants for years. But they began to wilt, almost as though they had some sort of fungus or disease. Only the plants in a direct line between the new bank of smart meters directly outside my kitchen and my wall heater every plant in that line has browned, and begins to drop leaves, and then the entire plant dies. One succulent I’d had for over 10 years it suffered the same fate as a healthy new orchid. I sleep on my floor in the living room about three feet from where this is happening to my plants. And I’ve been having problems with dizziness and weakness it wasn’t until I heard a piece on KPFA that I realized what had changed before the plants and my illness it was/is the smart meters. What can I do?